5 Ways to Embrace Living with Less in 2019. We’ve reached a point as a society where transitioning to a low or zero-waste lifestyle should theoretically be easy. In major cities, you’ll find bulk stores, co-ops and community gardens touting the benefits of eating local and having a minimal environmental impact. Plant-based cuisine and ethical clothing is the trend du jour. Being an environmental goddess is hip and it’s happening and we’re here for it. The benefits of going zero-waste are immeasurable. By reducing your impact on the environment and consuming consciously, you’re able to live life with more space to breathe, reflect and contribute. Zero-waste means living with less and looking at the world with a new outlook. One that reduces the anthropogenic impact on the environment. But what does zero-waste actually mean on the day-to-day? Is it the banishment of creative comforts in favour of groovy home-brewed products? Fear not. This isn’t the age of patchouli-smelling, pot-smoking, sauerkraut-making Aunt Carol (who, honestly, sounds like a great member of the family.) This the age of consciously moving forward with our decisions to make sustainability and zero-waste standard through actionable and accessible steps. This is the time to embrace living with more intention and less stuff. Are you with us? A quick reminder: up to 5 trillion plastic bags are used globally each year. That’s about 10 million plastic bags per minute. Plastic bags are traditionally made with high-density polyethylene, a substance that doesn’t break down easily and can stay in the environment for decades. But Australia isn’t totally lost - the country is pretty on top of transitioning away from single-use, lightweight plastic bags. As of early July 2018, Queensland and Western Australia joined South Australia, Tasmania, the Northern Territory and Australian Capital Territory to ban single-use plastic bags. Swapping plastic shopping bags for reusable totes, market bags or backpacks is one of the easiest ways to minimise waste. Our hot tip? Over-invest in reusable bags (we’re a big fan of large cloth bags like Kappi’s) and stash them everywhere. In your car, in your home, in your friends car. That way, you’ll always have a bag with you to avoid the plastic bag shuffle. A bag for groceries should be just half of your kit. Fruits and vegetables often come in natural packaging (banana peels! ), but are displayed in plastic trays or bags. While some may argue that packaging produce in plastic keeps the food sanitary and prolong shelf-life, we think it’s just as easy to buy produce without packaging. That’s where produce bags come into play. 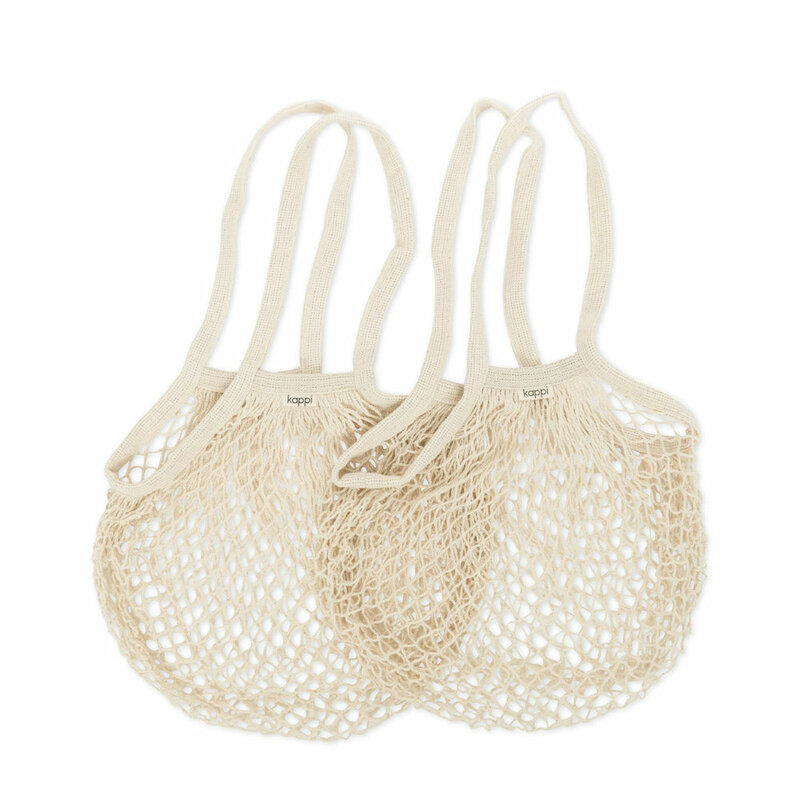 Chuck a few mesh bags into your grocery kit, and you’re ready to go. Transitioning to a low-impact way of living centres on making decisions simple and accessible. Rather than using plastic cutlery, disposable water bottles and styrofoam packaging, invest in a kit that includes: a take-away container, a reusable straw, a water bottle and a to-go coffee cup. Providing your own packaging is not only kind to the environment, but is sanitary, incredibly convenient and a mindless swap. Our anti-plastic kit crush? Anything from Bambu Home. Buying in bulk isn’t limited to just food. Shampoo, soap, toilet paper and other household items are readily available at bulk stores. Just remember to bring your own packaging! We recommend building a collection of glass bottles, reusable bags and jars. Keep in mind that some bulk stores aren’t equipped to offer a service to weight packaging and subtract it from your total bill - it’s good to call ahead and see what they can accommodate. We promise a visit to Terra Madre in Northcote, Melbourne, for bulk foods is worth the lines (yes, it’s packed from open until close). When was the last time you critically examined your home’s environmental footprint? Surely, a majority of the products and tools you own are plastic-derived and contain questionable ingredients, especially in the kitchen and bathroom. Think of 2019 as a time to detox your home cleaning kit. Living clean and intentionally shouldn’t be limited to what we put in our bodies, but should extend to the environment in which we exist and grow. That means limiting use of plastic-derived and chemical-heavy home products and making the transition to home tools and cleaning blends crafted from bamboo, wood or environmentally friendly materials and ingredients. Not literally. Compost tea is steeped compost in water - not so great for the gut, but fantastic for the garden. When we say drink the tea, we mean actually start composting. Compost is one of the easiest ways to begin a zero-waste movement in your life. Whether you live in a loft, home or in the country, composting is accessible and beneficial to the environment. Approximately 16% of methane emissions come from organics that can’t decompose in landfills. The separation of organics allows for natural degradation of organics without the resulting emissions. There’s a handful of ways to approach composting. These include traditional methods like a worm bucket, a bokashi bucket or creating a space in your property for compost to collect. Once you collect enough compost, the next question is finding a use for it. Does your community have a community garden that needs rich nutrients? Does your farmers market have any farmers interested in leftover compost? What about your larger community - is there infrastructure in place for compost on a town or city-wide basis? We love Going Zero Waste’s guide to backyard composting & apartment living. Get your friends excited and on board to spread the message. Everything is more fun with a group of supportive and vibrant people. Why not approach achieving a zero-waste lifestyle in the same way? Transitioning to a zero-waste lifestyle won’t happen overnight. Set challenges, make group dates to learn about composting, and get stoked on embracing living with less in 2019. We know, we know. There are so many great ways to integrate becoming waste-free. So tell us - how do you implement a zero-waste lifestyle in your day-to-day? Have any go-to waste reduction tips to share? Tell us all about it via the feed below!